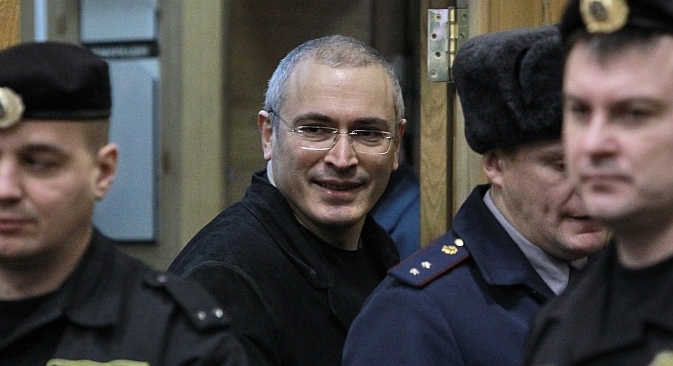 The Russian president’s unexpected initiative may set back preparation of the law. The economic amnesty decree is almost ready, according to members of the lower house of Russia’s Federal Assembly. The State Duma deputies hope to get the bill passed by July 5. Yet, if recent the proposals voiced by President Vladimir Putin are respected, the document might become inapplicable in legal terms. Addressing the St. Petersburg International Economic Forum (SPIEF), Vladimir Putin supported the idea of a large-scale amnesty for those jailed for economic crimes. An estimated 10,000 people, mostly businessmen, might walk free. Yet Putin’s magnanimity is not meant for all, but only for those “who agree and are ready to pay damages to the victims of their wrongdoing” – a condition that has embarrassed experts looking into the matter. “With things as they are, amnesty would be more appropriate were it to cover an entire category of prisoners; whereas the president’s mercy will just apply to a number of specific prisoners,” says Andrei Yakovlev, director of the Institute for Enterprise and Market Analysis at the Higher School of Economics. Meanwhile, these categories are incompatible with such “agree and ready to compensate” conditions, as they refer to specific people and their personal confessions. According to the expert, this could confuse two processes: amnesty and pardon. Elena Lukyanova, a member of Russia’s Public Chamber and a constitutional law expert, confirms that such nuances as the proposed “conditions” might strip the amnesty of its legal mechanisms. “Amnesty covers an indefinite number of people, and it cannot be initiated by the president; he can only initiate an act of pardon. The executive and legislative branches perform different functions. Amnesty cannot be granted to people ‘who confess their guilt and promise to restore the damage they did.’ On the one hand, the State Duma might well pass the decree, but there will be no mechanisms for implementing it. Neither the Criminal Code nor the Procedural Code, nor even the Constitution, envisage such mechanisms,” Lukyanova says. Her opinion is also shared by Ilya Shablinsky, who is a professor at the Higher School of Economics and a member of the Presidential Council for Civil Society Institution Development and Human Rights. Shablinsky says the president can always voice his ideas, but not all of them can be implemented from a legal point of view. “For example, the president expressed his opinion that all those born in the Soviet Union should be the citizens of Russia. Yet, when the experts gathered and discussed his proposal, it became clear that it has little sense in legal terms. Even so, we should not forget that such an idea of prisoners confessing their guilt and making restoration is just a nuance in this process, and it is important that the amnesty itself – being a very good initiative – not be overshadowed by this,” says Shablinsky. The experts, like the business community, point to the positive aspects of the amnesty, but they warn that this measure alone will not suffice: It is very important to allow business to develop further, instead of hoping for another amnesty. It is this factor, he believes, that will determine whether people freed from prison continue their business activities and create new jobs – whether entrepreneurs expand their businesses. “Today, the courts are inclined to convict. If things change, we will see really positive developments,” Yakovlev says. Andrei Korkunov, a high-profile Russian businessman and chairman of the board of directors of Odintsovskaya Confectionery Factory, supports Putin’s idea: If such a political move as an amnesty helped specific people and the innocent are freed, that will be a very good thing. “Those who implement this idea should be lauded for it. I know there are quite a number of innocent people in prison; they were accused on fabricated charges, especially in the economic sphere,” the businessman says. He also hopes for further changes in legal practice to encourage entrepreneurial activities. “No one will hope for another amnesty, carrying on their business as usual; the conditions for business must be changed, to improve the climate in the business community. And, in the end, we have people who lost their businesses and spent a year in prison, and after that they are told: ‘Sorry, it was a mistake.’ This will not boost business,” says Korkunov. Pavel Krasheninnikov, a State Duma deputy, confirmed that the amnesty document is being preparation and will soon be ready. However, Krasheninnikov did not explain how parliamentarians hope to resolve the conflict of law.